UIC senior center Tai Odiase will get to play at least one more game at the Pavilion. UIC didn’t reach its ultimate goal this season of winning a Horizon League championship and returning to the NCAA tournament. However, seniors Tai Odiase and Clint Robinson and the rest of the Flames, get a shot at a nice consolation prize in the 20-team College Insider Tournament. The CIT announced UIC will host an opening-round game Wednesday night at the Pavilion against Saint Francis (Pa.). It will be the Flames’ second appearance in the CIT after going 1-1 in 2013. This will be UIC’s seventh national postseason appearance, including the 1998, 2002, 2004 NCAA tournaments, the 2003 NIT, the 2017 CBI and the 2013 CIT. The Flames enter at 17-15, but they have lost their last three games, including an 80-75 loss to Milwaukee in the Horizon League tournament quarterfinals just over a week ago. Before its three-game skid, UIC had won 12 of 14 contests. 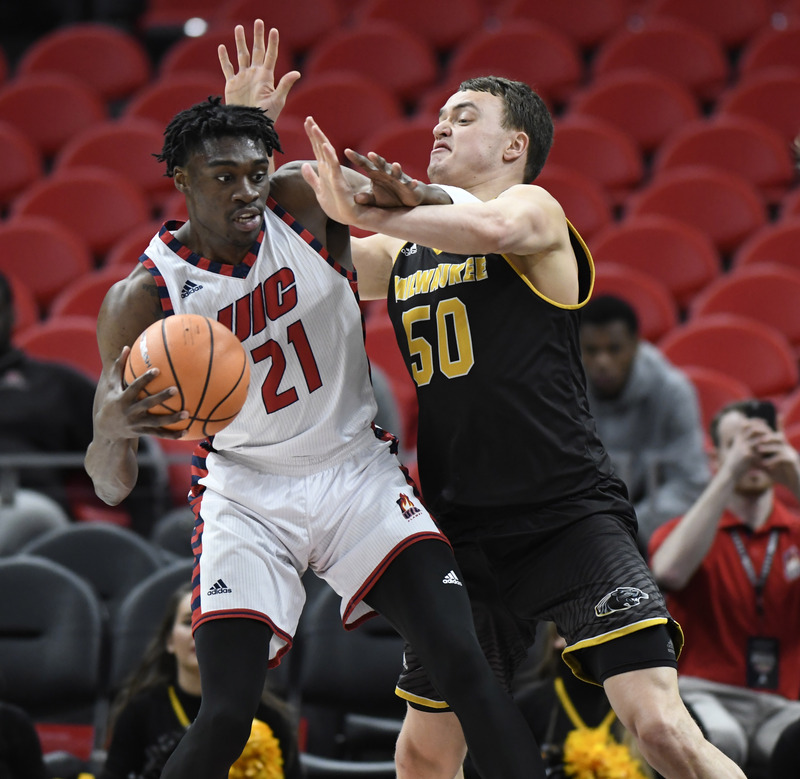 UIC made the CBI last season despite a losing record, but won home games against Stony Brook and George Washington before falling in the semifinals against Coastal Carolina. The deep run helped build some momentum and helped the Flames earn some valuable experience coming into this season. St. Francis finished the regular season at 18-12 overall and 12-6 in the Northeast Conference. Jamaal King, a 5-foot-10 junior guard, led the Red Flash at 18.3 points per game. Keith Braxton, a 6-4 sophomore guard, averaged 17.4 ppg and 9.7 rebounds per game. The Red Flash have a top-shelf offense that will challenge UIC as they average 79.6 points per game and shoot 47.1 percent from the field. For UIC, it’s about balance: Seven players average between 6.7 and 14.2 points per game. Sophomore Dikembe Dixson leads the way at 14.2 while sophomore guard Marcus Ottey sits at 13.5. Sophomore point guard Tarkus Ferguson is the engine to the team’s success since the start of 2018, helping the Flames go 12-5 since returning from a stress fracture in his right foot. He averages 9.7 points and 5.3 assists for the season.